Requires 52” x 68” of floor space, or we can custom build one just for you! 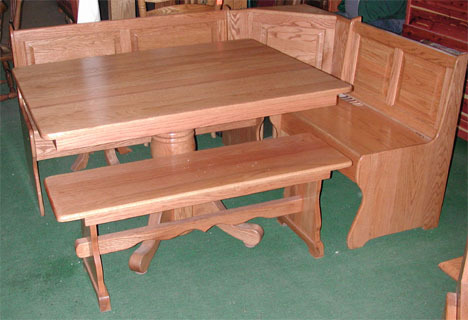 The corner bench of the Amish breakfast nook is actually 3 pieces bolted together, and it can be assembled as shown or in the opposite direction. The section on the left is 48” long and the section on the right is 32” long. The corner piece is 20” x 20” and could be left out if desired. The corner piece does not go all the way to the floor. Both bench seats open up and allow for 5” to 6” of storage within. Our corner breakfast nook features rounded corners for safety. If you live within about 300 miles of Lexington (Columbia), SC we will attempt to personally deliver your corner nook. We have often delivered them further away if the customer is close to one of our Amish distributors in Tennessee, Ohio or Pennsylvania (east Coast). You may also meet us “half-way” if you have a way to transport it - call or E-mail for details. Otherwise the corner nook will be shipped to you by truck on a pallet - typical shipping cost by truck is around $250 - $350 depending on where you are, whether you choose custom handling and if you order the bench or not. The three sections and the table are shipped unassembled and are easy to put together - all bolts and nuts are included. Because it comes unassembled, the corner nook will easily fit in a pickup with a cap, or a van type vehicle with the seats folded down or removed.